On Thursday, Nov. 7 from 1 p.m. to 4:30 p.m., Wilfrid Laurier University’s Office of Indigenous Initiatives teamed up with the library and the history departments from both Laurier and the University of Waterloo to create the event The Land We Are. 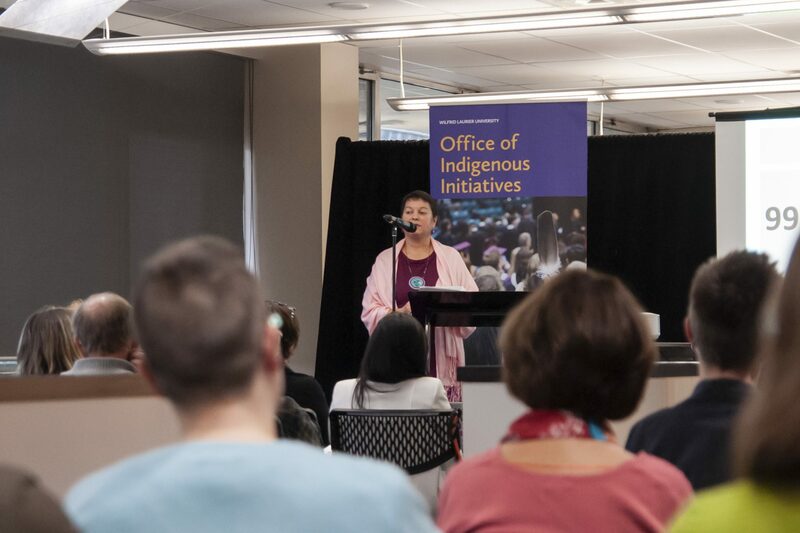 The event took place in the library and consisted of different speakers from different departments and throughout the region like Susan Neylan, an associate professor in history at Laurier, speaking on land acknowledgments and Phil Monture of the Six Nations of the Grand River. Another speaker at the event was Gary Warrick, an associate professor in Indigenous studies and Indigenous archaeology at Laurier. He began his speech by recounting a time in the 1970’s when he was a young archaeology student and excavated Indigenous burials. “The site dated to about 1300 give or take, and it was a pit filled with buried people who were disarticulate, which means they weren’t in the anatomical position, but I was a student, and I was tasked with taking those bodies out carefully and recording everything,” Warrick said. The bones Warrick found are, to this day, found at McMaster University, but they are trying to take them back to Six Nations and have Six Nations re-bury them, and Warrick is going to be present as he has one of the most personal experience when it comes to these particular bones. Warrick is also a professor of a first-year Indigenous studies course at Laurier, and realizes the difference that educating students on what Indigenous peoples have gone through in Canadian history that often gets bypassed can have a tremendous impact. “The school system does a terrible job of educating people on that Indigenous past, and that is such a big part of Canada. We need more education, just having one event and saying ‘Ok, we’ve done our part’, and I know the university isn’t thinking that way, but we need more and more events like this and aimed at different sectors of the population,” Warrick said. One of the main organizers of the event, Jean Becker, is the senior advisor for the Office of Indigenous Initiatives, and advocates not only for the education of Canadians on Indigenous history, but the history of Indigenous peoples who had previously lived right here in Waterloo region. “Phil Monture from Six Nations, who worked for the land and resource office at Six Nations for many years, he spoke about the Haldimand tract, the period from 1784 when the British awarded that land to the Haudenosaunee people, and he talked about the way the land disappeared from the control of the Six Nations,” Becker said. The Haldimand tract runs 10 kilometres wide on either side of the Grand River, and stretches all the way through to Orangeville, and is territory that was not properly paid for as the Six Nations received no income from it. One of the key reasons that The Land We Are was created is to educate students and members of the community about the injustices that have and continue to exist in Indigenous communities and is one of the main reasons Becker believes students need to come out and hear these speakers. “Indigenous peoples couldn’t vote until 1961. Up until 1951 First Nations people weren’t allowed to hire a lawyer, it was illegal, they would go to jail. This is in Canada, and in 2018 the Indian Act controls the lives of First Nations people, it’s still in existence and it’s a law that applies only to First Nations people. Canadians don’t know anything about this,” Becker said. The Land We Are was not only an eye-opener for those who may know little about Indigenous peoples in Canada, but those who reside in our own backyard that are underprivileged and overlooked due to false stereotypes. “There’s so many things that you learn when you go these events that you might not have ever known if you didn’t bother to go,” Becker said.